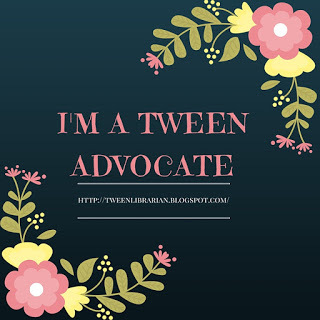 Tween Tuesday is a meme to highlight great reads for tweens! Add your link below and find a new middle grade read! About the Book: Knuckle and Potty are famous loveable characters who star in bestselling children's books. And their next adventure will take them to Happy World! But Knuckle and Potty are tired of being lovable-they want to be fierce! And they don't want to go to Happy World. So they plan a trip to the Outer-world to meet their author so they can rewrite their storyline. GreenBeanTeenQueen Says: First off, a big thank you to Unshelved, who wrote a comic about this book! Otherwise I'm not sure I would have discovered it. For tweens who like their comedies with a bit of a zany plot, Knuckle and Potty is perfect. There is tons of humor in this short graphic novel that will leave tweens cracking up. Plus, there are plenty of inside jokes that savvy readers will catch-the Chicken and the Beret, Knuckle and Potty's "celebrity writer". It's a quick read (I read it on my 15 minute break at work) and it would be perfect for younger tweens who are looking for a good graphic novel. 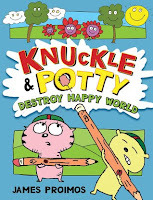 Knuckle and Potty are some of my favorite new graphic novel characters and I really hope we have more adventures to come from them! !